There was only one major team selection decision for either team; Zinedine Zidane opted for Isco over Gareth Bale, and Barzagli was selected by Allegri to allow Dani Alves to stay in the more advanced role he occupied against Monaco. The match began with good intensity, with Juventus largely on top in the opening moments. Whilst much of the pre-match build-up focused on the potential contributions of Dani Alves, it was his Brazilian compatriot Alex Sandro who proved more influential in these early stages of the game due to the impact of his presence on Juventus’ ball-progression. Each team had a naturally assymetric shape, perhaps simply because of the individual tendencies of the players involved. Whilst Real Madrid’s shape is generally similar when Isco and Bale play, their movement patterns are distinctly different. With Isco and Cristiano occupying free roles, both players naturally prefer to drift towards the left halfspace. Benzema’s role of making smart movements to create space for these two as well as onrushing movements from Marcelo also involves him drifting towards the left touchline often. 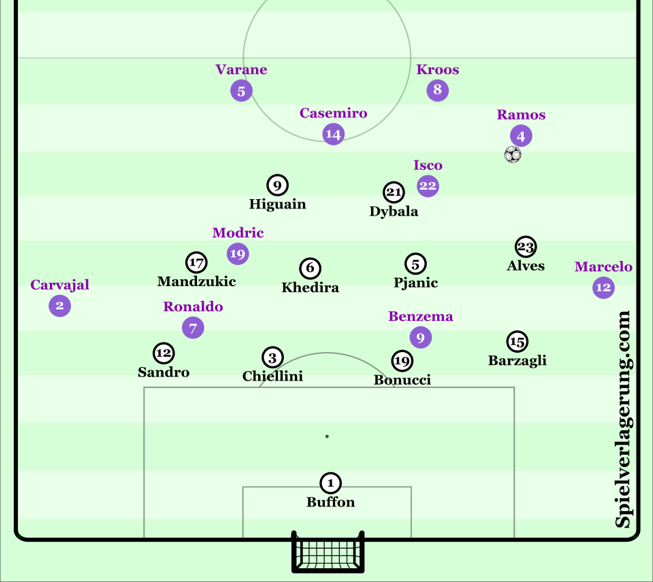 Similarly, Juventus’ shape was something between a 4-4-2 and a 3-4-3 depending on the particular moment, with Barzagli often pushed very wide in reaction to Alves’ aggressive forward movements. This advanced starting position created easy pressing access for Marcelo, allowing Toni Kroos to drop deeper and screen passes into Dybala, who would often occupy the right halfspace between the lines. The interaction of these two shapes made for an interesting first ten minutes, that favoured the side able to quickly shift play in the most appropriate manner: Juventus. Particularly during these moments – perhaps due to the psychological impact of playing in a final – Madrid seemed keen to [counter]press aggressively with the ball-far midfielder creating horizontal compactness around the ball. Naturally this combination of factors made it more difficult for Juventus to advance on the right, partially nullifying Alves & Dybala. But in moments when Pjanic could switch quickly through midfield, Modric would be confronted with the decision to press Khedira, or immediately drop diagonally backwards to the space where Alex Sandro would eventually receive the ball. Even if this decision were correct and well-timed, the distance was too big to allow quick coverage, and Juventus would receive the ball in a strong dynamic position on the left before Real Madrid could transition into their flatter defensive shape. Aside from executing the counterpress well, this issue is often solved either by having a midfielder with high running capacity on the outside to cover large distances, or have the full-back push forward to engage the opponent and the rest of the team pendulate and cover behind. In this case, Mandzukic made smart movements to react to the situation and was a key reason the switch created such an advantage for Juventus. If necessary, being aggressive to receive the first ball, but more often making movements to occupy Carvajal and create space for the onrushing Sandro. Alongside some other key reasons, this created many semi-transition moments whereby neither team could comfortably control the game. However, as the game continued into the second half, the tempo of the game reduced with more sustained periods of organisation for each team. The advanced positioning of Carvajal during attacking organisation dragged Mandzukic into deep areas where he was unable to influence the subsequent transition in the same way – more detail on that later. To understand the questions Allegri faced in preparing his defensive approach before the game, it’s useful to understand Real’s strategy in possession. Zidane’s side are based quite heavily on avoiding the opponent to have stable deep circulation, and eventually create safe progressions and breakthroughs. They often had as many as seven players behind the ball. In line with their general strategy, they focused on maintaining stability with the ball rather than creating positional superiorities within Italian structure. Since most opponents, logically, defend the centre primarily, Real can often be seen circulating in a U shape, from one wing to another as part of their aim to avoid the opponent and have stable possession. With both centre backs, Kroos, Modric and both full-backs usually operating outside the opponents’ block, the distances the opponent has to cover to get access are very large. Furthermore, doing so, almost inevitably creates space in central areas for the likes of Isco and Benzema, a perilous situation for any team. Getting the balance between access to Real’s deep players, whilst protecting the defence against Real’s forwards is very difficult. Against Real’s defensive circulation Juventus were largely in a passive 4-4-2-0 shape, where their organisation was not challenged anywhere as the forwards were so close to the second line, thus providing support in the half spaces and having access to either the fullback or central midfielder. There was however, some asymmetry as part of their aim to reduce the influence of the Real midfielders. Higuain would often position himself to block Casemiro, Dybala likewise on Kroos, whilst Mandzukic the nominal left midfielder would stay narrow to block his mercurial countryman Luka Modric. This led to 4-3-3-0 structures which could flexibly move into 3-4-3 with Sandro pushing up on the left to press Carvajal. This positioning would encourage dribbles or passes towards the full-backs from the Madrid centre backs. When the ball was forced into Marcelo or Carvajal, Juventus would press more intensely, with the ball-near players marking the nearby opponents. Real would thus be forced to re-circulate across their back line. This was a further trigger Juventus to move up from their zonal defensive base to a man-oriented high pressing approach. Vitally, whilst the Juventus forwards moved up to press the Madrid defensive line, they used their cover shadows to prevent passes in the opposite direction, which would have killed their pressing momentum. This allowed the Italians to force Real into riskier circulation, where their chances of regaining possession increased. Once the ball had been forced to the opposite side, Real would have to play into the centre, where the receiver’s field of vision was facing the nearby touchline. In these situations, Juventus could outnumber the receiver with a number of ball-near players. Their ability to win the ball in these situations was still inconsistent, since the individual press resistance of the Spaniards allowed them to protect the ball in such risky situations. In response to the Juventus forwards, Modric and Kroos began to drop deeper and wider. This would either create more space in central areas (if the strikers followed), or give the midifelders more time on the ball. An interesting feature of Juventus’ defensive scheme, was the narrow pressing from the wide players. Zidane’s side use frequent half space switches between Kroos and Modric to control the game and push the opponent back. In response to such passes, the ball-near Juventus winger would often press aggressively on the receiver’s blind side, forcing them to play back into the initial area, thus preventing the pressure relieving switch. This happened more frequently on the left where Mandzukic would prevent Modric turning out, than on the right with Alves, this was potentially due to what lay behind them. On Juventus’ left, if Mandzukic was bypassed in these situations, Real could find Carvajal in an isolated situation against Sandro, quite a controllable situation. However, if Alves was bypassed Marcelo could be isolated against Barzagli, a far less desirable match-up. As a result, Kroos was afforded more time when receiving such passes, and Real spent more time building through the German. When Kroos did receive, Alves would try to press whilst blocking the pass into Marcelo. However, this opened central spaces besides Pjanic where Real’s roaming forwards (particularly Isco) could drop in and receive the ball. Real rarely attacked directly from here, but could use this to force Allegri’s side deeper. The timing of the pressing from Alves and Mandzukic was key. When their timing was good, they could get close enough to block escape routes and regain possession or force Real back. Even by Real’s standards, during the first quarter of the game the positioning of the midfield players was extremely cautious. This was noticeable with the positioning of Kroos and Marcelo in the same space and both behind the ball which had two major consequences. Firstly, Dani Alves wasn’t challenged since he could position himself to view both opponents, have quick access to both and have close cover from Pjanic and Higuaín. Secondly, Barzagli only had to defend Benzema or Isco at once, meaning he didn’t have to choose between two options thus not suffering any sort of decisional crisis. The involvement of Isco, who played in a #10 free role was mostly harmless. The task of the Spaniard was clear early in the game, as the main player to provide support in both sides creating a numerical superiority which could be used to create an advantage. Combined with his pressing resistance this could have allowed Real Madrid to disorganize Juventus and move higher in the pitch while threatening especially Barzagli’s side. However, despite his willingness and vigorous movements off the ball, the actual collective value was rather meaningless. In the opening period he insisted on coming to his own half to receive the ball directly from the centrebacks, and even if this was effective, the strategic value and collective implications were poor and sub-optimal. From one side, it made the attacking structure flatter since there were already were too many players behind the ball. His main role was about creating connections from the half spaces in the relationship with Marcelo and Kroos. However, his timing of offering a passing option was too late many times, thus making easier the defensive access from Juventus’ defenders. This is a nice way to understand the importance of the correct timing in giving passing options, and the value of being positioned in such way that you constrain the defender’s participation before the second player has controlled the ball. When the timing is not good enough, the defender doesn’t have any doubts – decisional crisis – of where the pass could be directed and he can anticipate more accurately thus constraining the receiver more efficiently. In this case, Isco’s willingness to support everywhere in the pitch had the opposite effect, he couldn’t support when and where he was supposed to, making Dani Alves’ defensive actions easier. 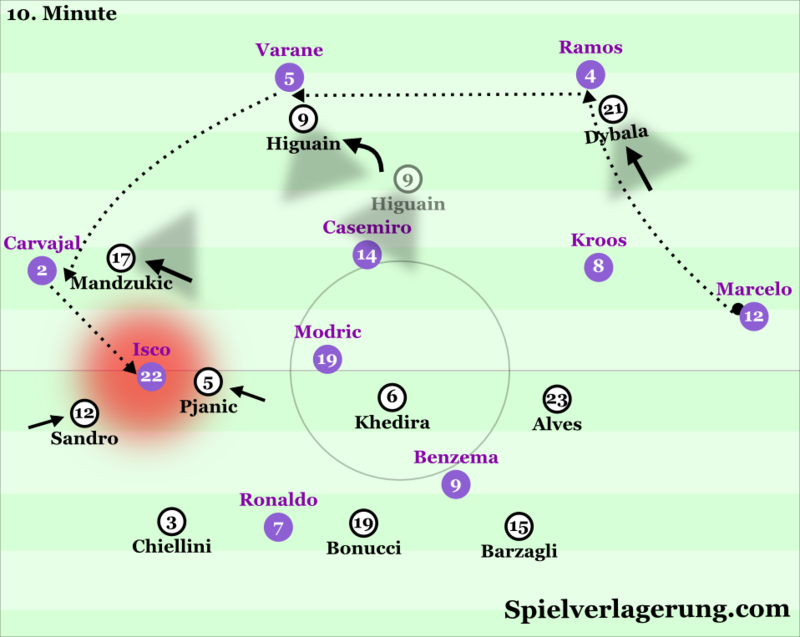 It also had two more secondary effects; as mentioned above, the timing of the support in the half space was late at times, so it forced Cristiano and Benzema themselves to create both connections between the lines and also threatening the Italian defence in depth. Both things were suboptimal as they lack the pressing resistance and dribbling skill of the Spanish player, and the manipulation of the defensive line was not optimal with both forwards in the same sector. Furthermore, the performance on the ball from Isco was also questionable. Although he was able to receive several times behind Dani Alves after adjusting his positioning, the subsequent decision making on the ball was suboptimal. This was partly provoked by Juventus’ defensive compactness and fast adjustments from Pjanic and Khedira, thus forcing his actions towards naïve dribbles into the wing, further isolating the next receiver. Considering the above, it is no surprise Real struggled to create any chances and even to connect passes in Juventus’ half. As such, most of their attacks ended with depth passes through the wing which were easily defended by Allegri’s side. As the minutes passed Real were able to find themselves more consistently and the timing in the connections improved in the first moments of the attack. This was probably too dependent on the overload in the left side where many times Benzema, Cristiano and Isco were moving to provide passing options. From there, the logical and common subsequent step is a quick switch to the opposite flank where Carvajal could exploit the positional superiority to create a depth cross. However, this was rarely a profitable option for two main reasons. The distances to cover for Sandro were short enough – due to Juventus’ low block – to allow him to defend proactive and aggressively the switch, especially when it was done by a long pass. The second reason was related with Real Madrid’s collective positioning in the previous moments. The front three players had to be involved in the first moments of the attack, providing passing options in the left side. Due to a combination of the reasons stated before and simply bad decision making, they weren’t able to manipulate Sandro’s position towards the centre of the pitch. Nor were they able to manipulate his defensive actions by their behaviour in the right halfspace, leaving Carvajal too isolated in the process. Moreover, Sandro had the support of Mandzukic at times even making 2v1 situations for the defenders. In the second half, Zidane’s side focused more on supporting the ball carrier on the wings, particularly on the left side where they formed triangle like structures. This gave Kroos simple options to bypass Alves’ pressing with wall passes to Marcelo via Isco or Benzema. 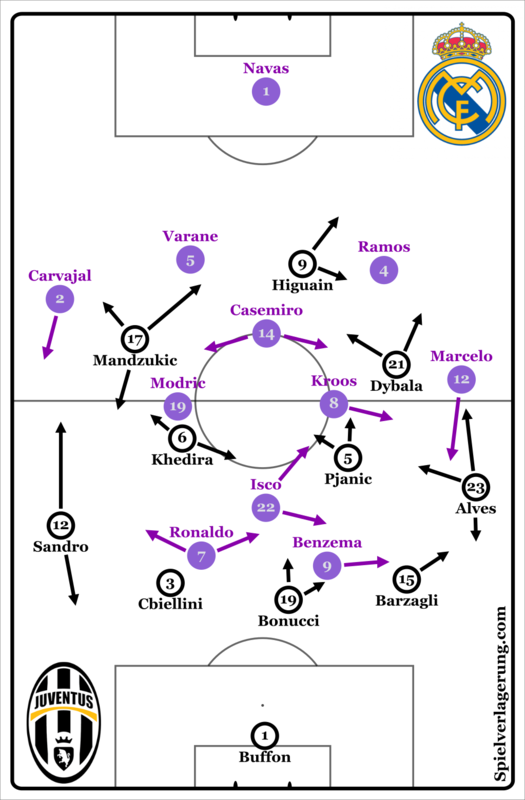 Furthermore, when Marcelo received the ball deeper, they looked for 3rd man depth runs from Isco or Ronaldo with Marcelo drawing Alves into a challenge and the Madrid runner attacking the channel between Barzagli and Bonucci. These contributed to a dominant second half from the Spanish side, where they could force Juventus deeper making counterpressing easier. After a ruthless four-minute spell, Real were 3-1 up. When leading, Real’s strategy becomes easier to execute as the opponent becomes more desperate for access. With deep and wide circulation they can draw the opponent forward and open spaces in the centre for the likes of Isco and Ronaldo. Combined with the large distances they had to run and the stage of the game, this led to Juventus having far weaker access for much of the second half. While Juventus’ choice of pressing higher could be understood as a mean to get higher counterattacks which would have suited better Higuaín and Dybala’s skills, the functional consequences were terrible for the Italian defensive organisation. Since Higuaín and Dybala were now targeting Real’s centrebacks, they were unable to access Real’s deep central midfielders and fullbacks. This forced Mandzukic and especially Dani Alves to move higher in order to get access to them. As soon as Kroos and Marcelo started to guess how to manipulate them to find an advantage, the game favoured the Spanish side. The manipulation of Alves’ press through the execution of a third man action with great timing and approach in the connection from Isco (but at times Cristiano) allowed them to find Marcelo with advantage. From there the relationship between him and Isco was the beginning of either a fast attack looking to switch to Carvajal, who in the second half found himself in better conditions against Sandro. Or more usually, it was a means to, through a dribble action and/or quick passing between them, destabilise the Italian defensive structure. Kroos is able to connect with Casemiro who benefitted from the larger distances between Juventus defenders. The Brazilian affords a long diagonal pass to Carvajal. In this case Sandro is not able to defend proactively as he has to cover larger distances due to the manipulation provoked by the positioning and prior movement from Cristiano. This left Juventus’ midfielders clueless as the adjustments weren’t affordable due to the longer distances. 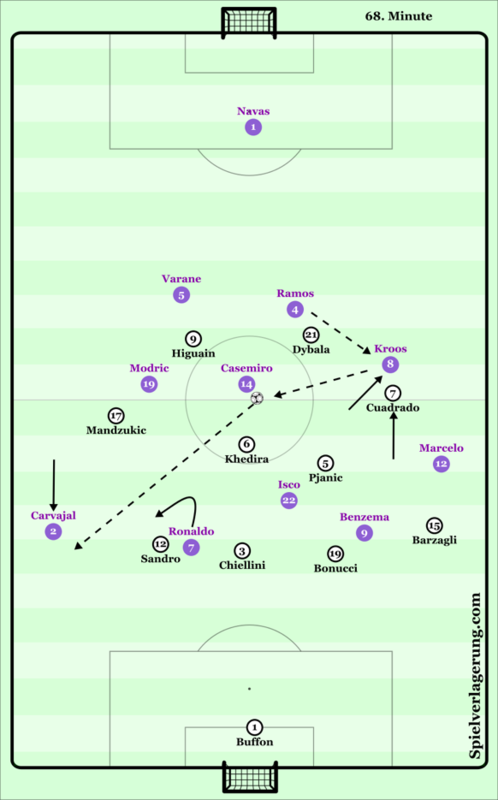 Consequently, this allowed Real’s central midfielders to move themselves higher in the pitch, establishing an attacking structure in Juventus’ half while at the same time the Italian side were pushed backwards to the defensive third. Firstly, the role of Cristiano and especially Benzema in manipulating and pushing back the whole defensive line by threatening in depth and giving passing options in between the lines. This prevented Juventus’ defenders from giving cover and being able to adjust behind the front pressing line. 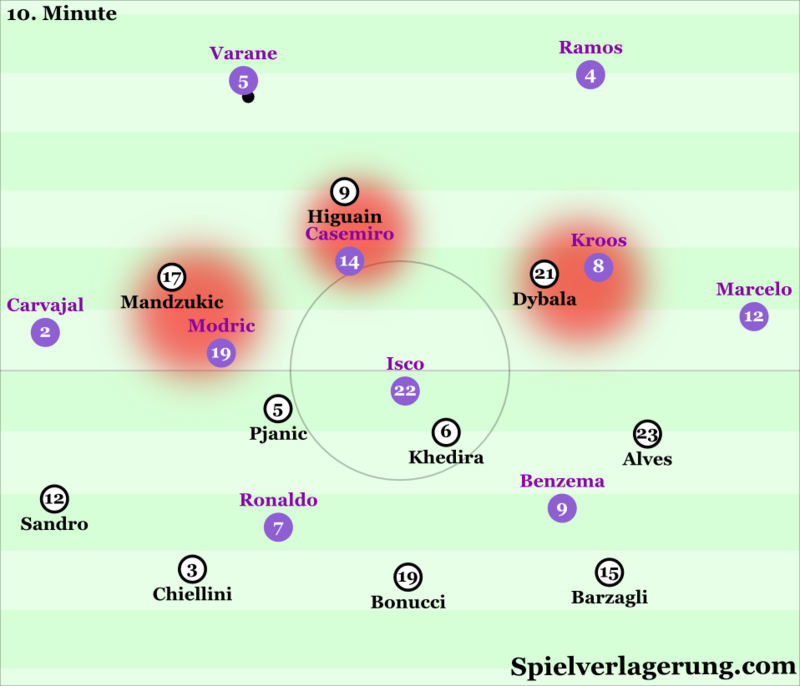 It was an essential feature as Benzema and Cristiano were also viable passing options in the half spaces at times, thus also manipulating Italian side’s central midfielders. Secondly, the approach employed in the advantage creation wouldn’t be possible without the highly skilled individuals involved in the situations. They were able to maximize the smallest spatio-temporal conditions in order to quickly connect between them and dribble destabilising Juventus’ midfield. In this regard it’s important to highlight Kroos’ performance in the distribution and timing of the passes in order to exploit the first advantage connecting with the free-man. The longer possessions in the attacking half achieved from the connection and pressing resistance from Isco in particular, were very profitable for Real Madrid. Not paricularly due to the direct production from these situations since the collective chance creation wasn’t too refined. However, the longer passing sequences combined with the highly skilled individuals were enough to create some quality chances and also position many players close to the box to then being able to win many second balls and effectively counterpress after the crosses. After a fairly even first half, Real Madrid were comfortably able to take the win with a dominant second half display. This led them to their second consecutive Champions League title, and third in four years. Whilst it could be argued that the lack of dominant ‘super-teams’ has allowed for this, you can only beat what you are confronted with. In this case, Juventus were regarded as a very strong team in many departments that were ultimately dismantled by Los Blancos. Indeed, much of the role of the manager of Real Madrid is to create a situation whereby all players work towards the execution of the same gameplan in a symbiotic manner. Previous managerial reigns have indicated that this is not such an easy task, and Zidane is clearly reaping the rewards of creating such a situation. Despite the strong second half display and undeniably excellent trophy haul, however. Real Madrid have not answered every question regarding their future performance. It will certainly be interesting to see how they, and their opponents, react and adapt as they chase their third consecutive title. It is easier said than done. Could you write an article to show us how we can analyse a match tactically? Could old beloved 352 have been a better disposition in order to control Real key players, maybe leaving Casemiro without man? 3 defenders let more aggressive marking on Ronaldo and Benzema; 3 MF in order to control Isco, Modric and Kroos; the wingers for Marcelo and Carvajal; Dybala helping controlling Kroos and Higuain between Ramos and Varane. I don’t think so. Partly because using a defender to man mark an opposing midfielder would create gaps in their backline for Ronaldo and Benzema to run into. And also because marking only Isco wouldn’t be as successful as marking Hazard due to the different quality and playing style of Kroos and Modric in comparison to the Chelsea-midfielders. We can intuitively say that Modric and Kroos are better at bypassing an overcrowded centre than Matic and Kante but to definitively say that the man-marking strategy wont work wouldnt we need to prove it numerically? Of course you would have to prove it to be sure (next question: how often do you need to prove it to have a reliable and statistically significant database?) but you can still make an educated guess based on other situations. My first point was: If Isco is constantly marked by a defender there will at some point open gaps in the remaining defensive line – be it inbetween players or out at the touchline. You could prevent this by fielding a fifth defender but that would again harm you in other ways (Atletico have – as far as I recall – never played a five-man-defense under Simeone) and spaces (the spaces of Modric, Kroos and Varane). My second point was: Marking Isco is simply not enough. Take out Isco and you allow Modric, Benzema or Kroos to shine due to a lack of coverage. You could prevent this by marking them, too – but where do you stop man marking? And: Is man marking really effective against a team excelling at breaking man marking approaches? Based on these two points, I think it is possible to predict the outcome of such a setting to a certain degree – but I agree, you never know until you tried it (many times). Would juve and Atletico have benefited by using chelini and filipie Luis to man mark isco like how mourinho used Herrera against hazard?